The Satellite III is Oval Window Audio's most popular induction loop system for large facilities such as houses of worship and auditoriums. 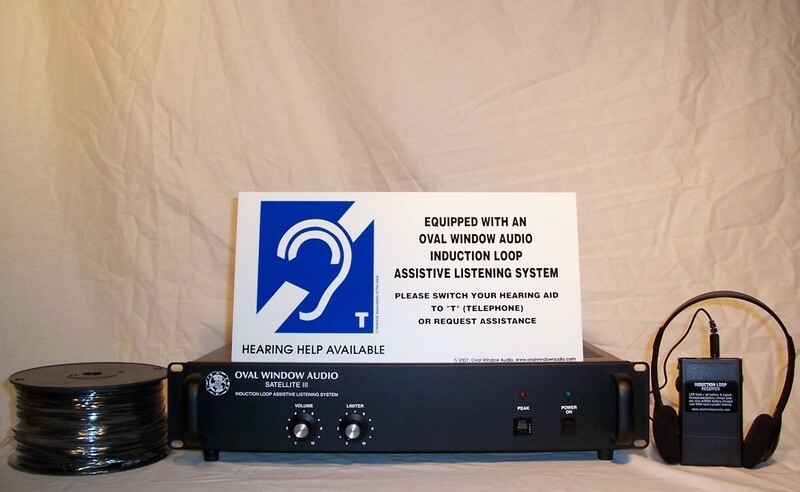 Click here to learn how induction loop assistive listening systems work. Compatible with all telecoil-equipped hearing aids and cochlear implants, each Satellite III induction loop system improves speech intelligibility for up to 300 people. An Induction Loop Receiver is included for monitoring the system's performance. 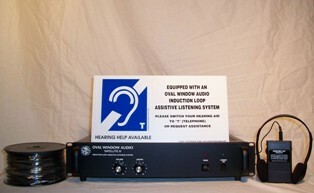 Low-cost Induction Loop Receivers are available for hard of hearing people who do not own telecoil-equipped hearing aids. Click here to view the back of the Satellite III. A 250-foot spool of two conductor 14-gauge clear wire for connecting as a two turn series loop. A 500-foot spool of loop wire (if the loop perimeter exceeds 325 feet, please click here). Specify your preference for black or white wire. Comprehensive instructions and unlimited telephone support. Click here for Satellite III specification sheet and installation recommendations. Click here for the Satellite III Quick Set Up Guide. "The nicest thing since we got our loop up and running has been to see one brother, who is very hard of hearing, engaged with the Sunday morning messages again. He's pretty demonstrative when he can hear what's being said! Thanks for making a good product like this available so people like him can enjoy being a part of things." -- Mark White, Cornerstone Bible Fellowship, Rochester, N.Y. Oval Window Audio is so confident our products will meet your needs that we give you a 30-day money- back guarantee. If for any reason, you are not satisfied, simply call us at (303) 447-3607. We'll be happy to issue a replacement or a refund.